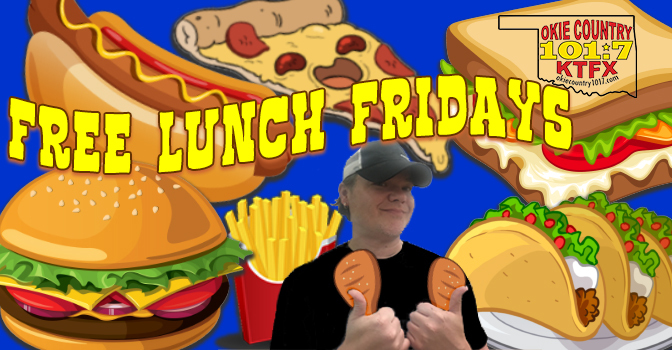 Free Lunch Friday's Join us Friday's for Lunch, and you could win lunch on us! A complete copy of these Standard Contest Rules can be obtained at the offices of radio station KTFX(the “Station”)owned and operated by Payne Media Group or one of its subsidiary companies, during normal business hours Monday through Friday or by sending a self-addressed, stamped envelope to the above address. Unless otherwise specified, employees, agents and affiliates of Payne Media Group and its subsidiaries, contest sponsors, other radio, television and print advertising companies serving the Station’s metro area, and their immediate family members and household members are not eligible to participate or win Station contests. The term “immediate family members” includes spouses, parents, siblings, grandparents, children, grandchildren and cohabiting significant others. By participating in this contest, each participant agrees to waive any and all claims for damages for death, personal injury, loss of property or property damage that he or she may sustain as a result of his or her participation in the contest and/or the use of any prize, and any damages or losses arising from the implementation or carrying out of the contest or any participant’s failure to win the contest or receive the prize, and to release Payne Media Group, the Stations, and their parent companies, subsidiaries, affiliates, directors, officers, employees and agents from any and all liability arising out of or connected in any way with his or her participation in the contest, even though that liability may arise out of an intentional act, omission, negligence or carelessness on the part of the persons or entities mentioned above.